For a country that is in need of greater racial harmony, help is on the way. 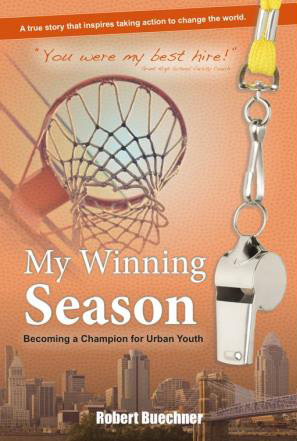 Local attorney and author Robert Buechner has raised the bar for all of us as he puts forth a compelling call-to-action through his new book, My Winning Season: Becoming a Champion for Urban Youth. In this heartwarming story readers will learn of the harsh reality many urban students face on a daily basis and some specific steps that can be taken to bridge the gap between that reality and a future of success. This is a must read for baby boomers, business professionals, students, athletes, coaches and anyone who wants to make a difference in the world. It combines everything he loves and has worked for thus far in his life, including helping to transform the lives of inner city children. He is a radiant example for all baby boomers... and an inspiration for the rest of us. After spending two seasons volunteering his time to affect positive change as an assistant coach for a local inner-city high school basketball team, Buechner chronicles his experiences in his new book My Winning Season: Becoming a Champion for Urban Youth. When racial unrest plagues our country, Buechner's win-win coaching experience offers compelling reasons for all of us to consider how we can follow our passions to interface with urban youth.